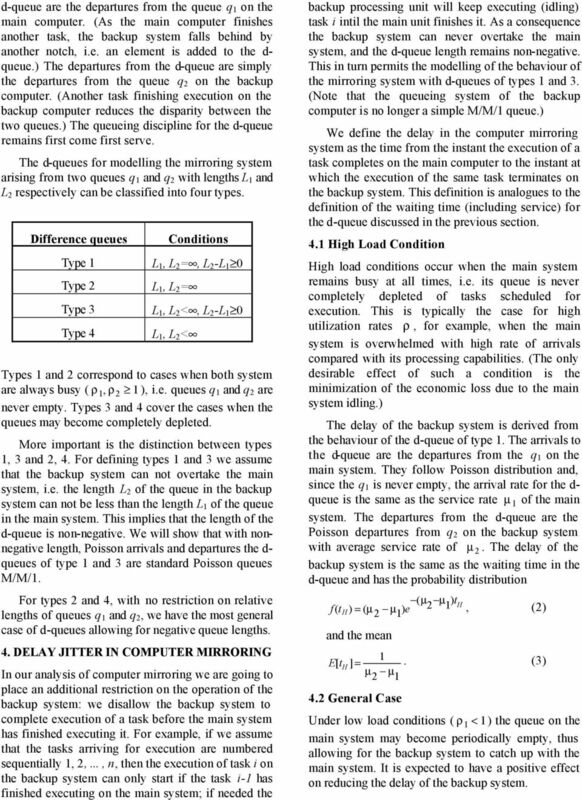 Download "Modelling the performance of computer mirroring with difference queues"
3 d-queue are the departures from the queue q on the main computer. (As the main computer finishes another task, the backup system falls behind by another notch, i.e. an element is added to the d- queue.) The departures from the d-queue are simply the departures from the queue q on the backup computer. (Another task finishing execution on the backup computer reduces the disparity between the two queues.) The queueing discipline for the d-queue remains first come first serve. The d-queues for modelling the mirroring system arising from two queues q and q with lengths L and L respectively can be classified into four types. Difference queues Type Type L, L = Type 3 Conditions L, L =, L -L 0 L, L <, L -L 0 Type 4 L, L < Types and correspond to cases when both system are always busy ( ρ, ρ ), i.e. queues q and q are never empty. Types 3 and 4 cover the cases when the queues may become completely depleted. More important is the distinction between types, 3 and, 4. For defining types and 3 we assume that the backup system can not overtake the main system, i.e. the length L of the queue in the backup system can not be less than the length L of the queue in the main system. This implies that the length of the d-queue is non-negative. We will show that with nonnegative length, Poisson arrivals and departures the d- queues of type and 3 are standard Poisson queues M/M/. For types and 4, with no restriction on relative lengths of queues q and q, we have the most general case of d-queues allowing for negative queue lengths. 4. DELAY JITTER IN COMPUTER MIRRORING In our analysis of computer mirroring we are going to place an additional restriction on the operation of the backup system: we disallow the backup system to complete execution of a task before the main system has finished executing it. For example, if we assume that the tasks arriving for execution are numbered sequentially,,..., n, then the execution of task i on the backup system can only start if the task i- has finished executing on the main system; if needed the backup processing unit will keep executing (idling) task i intil the main unit finishes it. As a consequence the backup system can never overtake the main system, and the d-queue length remains non-negative. This in turn permits the modelling of the behaviour of the mirroring system with d-queues of types and 3. (Note that the queueing system of the backup computer is no longer a simple M/M/ queue.) We define the delay in the computer mirroring system as the time from the instant the execution of a task completes on the main computer to the instant at which the execution of the same task terminates on the backup system. This definition is analogues to the definition of the waiting time (including service) for the d-queue discussed in the previous section. 4. High Load Condition High load conditions occur when the main system remains busy at all times, i.e. its queue is never completely depleted of tasks scheduled for execution. This is typically the case for high utilization rates ρ, for example, when the main system is overwhelmed with high rate of arrivals compared with its processing capabilities. (The only desirable effect of such a condition is the minimization of the economic loss due to the main system idling.) The delay of the backup system is derived from the behaviour of the d-queue of type. The arrivals to the d-queue are the departures from the q on the main system. They follow Poisson distribution and, since the q is never empty, the arrival rate for the d- queue is the same as the service rate of the main system. The departures from the d-queue are the Poisson departures from q on the backup system with average service rate of. 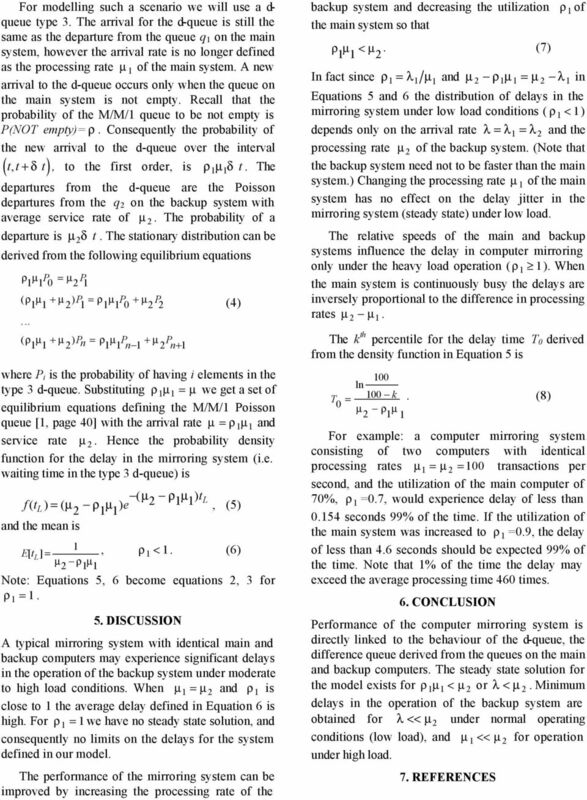 The delay of the backup system is the same as the waiting time in the d-queue and has the probability distribution ( ) th f ( th ) = ( ) e, () and the mean E[ t H ] = 4. General Case. (3) Under low load conditions ( ρ < ) the queue on the main system may become periodically empty, thus allowing for the backup system to catch up with the main system. It is expected to have a positive effect on reducing the delay of the backup system. 5 . Cox, D. R., Smith, W. L., Queues, Methuen & Co Ltd, Saaty, T. L., Elements of Queueing Theory, McGraw-Hill, White, J. A., Schmidt, J.W., Bennett, G.K., Analysis of Queueing Systems, Academic Press, 975. How Useful Is Old Information? Outline. Simulation examples will be given in queuing, inventory, reliability and network analysis. Maximum Profits. Desired Service Level. Keywords: Dynamic Load Balancing, Process Migration, Load Indices, Threshold Level, Response Time, Process Age. Simulation of Call Center With. 1 CHAPTER 1 INTRODUCTION 1.1 MOTIVATION OF RESEARCH Multicore processors have two or more execution cores (processors) implemented on a single chip having their own set of execution and architectural recourses. 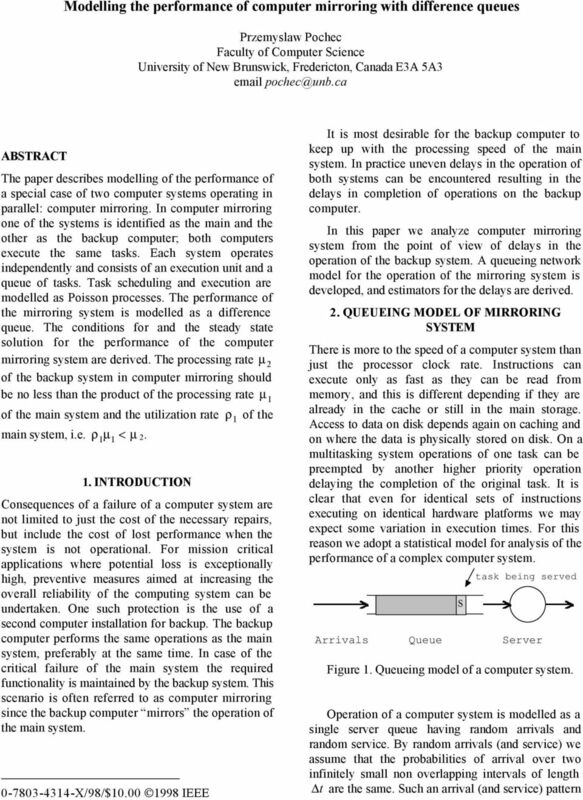 FAULT TOLERANCE FOR MULTIPROCESSOR SYSTEMS VIA TIME REDUNDANT TASK SCHEDULING Hussain Al-Asaad and Alireza Sarvi Department of Electrical & Computer Engineering University of California Davis, CA, U.S.A.
Queuing Theory Queuing Theory Queuing theory is the mathematics of waiting lines. It is extremely useful in predicting and evaluating system performance. Queuing theory has been used for operations research. Cloud Storage and Online Bin Packing Doina Bein, Wolfgang Bein, and Swathi Venigella Abstract We study the problem of allocating memory of servers in a data center based on online requests for storage. CPU Scheduling 101. The CPU scheduler makes a sequence of moves that determines the interleaving of threads. Important Probability Distributions OPRE 6301 Important Distributions... Certain probability distributions occur with such regularity in real-life applications that they have been given their own names. Network Model. University of Tsukuba. of the system. Load balancing policies are often. used for balancing the workload of distributed systems. Some Computer Organizations and Their Effectiveness. Michael J Flynn. IEEE Transactions on Computers. Vol. c-21, No.